Shelby Rorick knows she is unusual. But for her, delving into mathematical equations and seeing numbers translated into visual patterns is like visiting Disneyland. Misconceptions she has never entertained. Math came alive for Rorick in middle school, when she discovered how the chronology of the given operation – addition, subtraction, multiplication and division – determines the answer to an equation. She came to love whittling a long list of symbols and numbers down to a neat little sum. When she was warned calculus would be onerous, she mastered it and looked forward to tackling discrete structures and differential equations. After high school, Rorick studied math at Schenectady County Community College and saw that she was drawn to both theory and application. By the time she graduated from there, “I was a math junkie,” she admits. Next, she came to Saint Rose with the assistance of a Joan Sheridan Barlow ’54 Endowed Scholarship recognizing her talent in math. She was immediately struck by the close attention professors pay to their students. With their guidance she not only continued learning the foundations but came to see the connections of math to just about everything else. And Rorick glimpsed the power of mathematics to address questions of science. Rorick is one such student. Working with Eladdadi, Rorick did exploratory research that showed how math can be used to understand the brain. The work came to the attention of Rob Flint, a professor of psychology, who invited her to take part in his long-term neuroscience research. The result is “Mathematical Modeling of the Memory Reconsolidation Effect Across Three Studies, Using Rattus norvegicus,” a study that looked for a pattern among three studies analyzing memory in rats. “I learned that I have two disciplines I can go back and forth with, even if I don’t study psychology,” said Rorick. This fall Rorick began pursuing her master’s degree in math at the University at Albany. She is learning advanced linear algebra and the foundations of analysis. She is especially interested in mapping the brain to address epilepsy, a disease she herself has. Specifically, Rorick would like to study the side effects of the medicine she takes to stave off seizures. 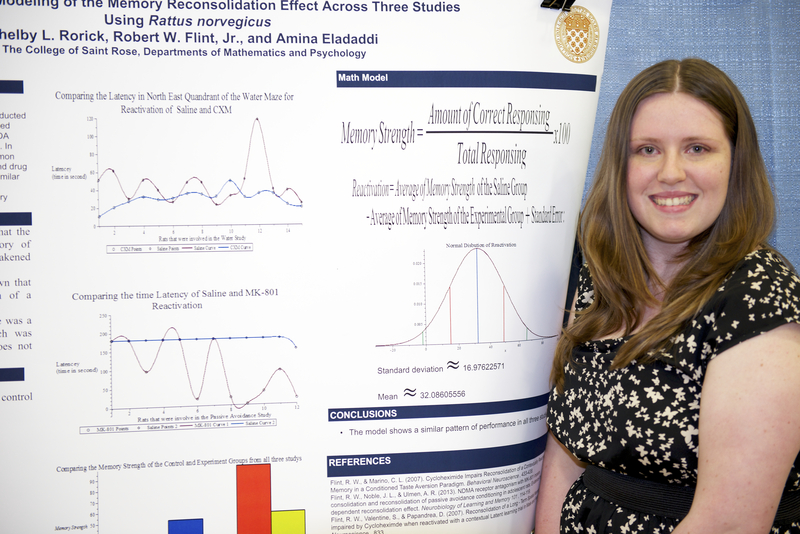 She is sure the research she did at Saint Rose is making a huge difference in graduate school, where she is expected to work independently and persevere through tough problems. Rorick has her share of hard days, when she misses one cue that makes it impossible to solve a problem and she feels like she is “wandering without headlights.” Then again, mathematicians can spend years struggling with a single problem. Rorick has no doubt about how crucial it is in answering big important questions. To make her point she reflects on the words of another highly respected Saint Rose professor who greatly influenced her, Joanne Powers. ← What do I wear? Interview attire and more!